Leigh Chen Sanders is sixteen when her mother dies by suicide, leaving only a scribbled note, 'I want you to remember'. Leigh doesn't know what it means, but when a red bird appears with a message, she finds herself travelling to Taiwan to meet her maternal grandparents for the first time. Leigh is far away from home and far away from Axel, her best friend, who she stupidly kissed on the night her mother died, leaving her with a swell of guilt that she wasn't home, and a heavy heart, thinking she may have destroyed the one good thing left in her life. Overwhelmed by grief, Leigh retreats into her art and into her memories, where colours collide and the rules of reality are broken. The only thing Leigh is certain about is that she must find out the truth. She must remember. Identifying her environment with colours, Leigh Chen Sanders reminisces the brightness of laughter, the gentle caressing of keys as the house is bathed in music, the hues of romance muted, the darkness slowly pulling her mother into depression. Leigh is a biracial, a Taiwanese Irish American young woman, an artist of smudging and hues. Once a house awash with the melodious sound of her mother is now enveloped by despair, returning home to find her mother unresponsive, her life taken by clinical depression. I try to think of a colour to match it, but all that comes to mind is the blackness of dried blood. I can only hope that in becoming a bird my mother has shed her suffering. The nonlinear narrative accompanies Leigh in the moments after discovering her mother, despair reverberating throughout the family home. Dorothy Chen Sanders was diagnosed with depression, characterised compassionately and reiterating that mental illness is an incurable, continual and indiscriminate diagnosis. Here is my mother, with wings instead of hands, and feathers instead of hair. Here is my mother, the reddest of brilliant reds, the colour of my love and my fear, all of my fiercest feelings trailing after her in the sky like the tail of a comet. With a discarded note and a promise to remember, Leigh is doused in shades of sterile white, her colours now depleted. Leigh will journey to Taipei to uncover a life shrouded in whispers, perusing the elusive crimson feathers her mother has adorned after passing. The infusion of Taiwanese mythology is ethereal. As Leigh immerses herself in the Taiwanese landscape, she experiences moments of dissociation carried on the whispers of foreigner by curious bystanders, raised without the influence of her Taiwanese parentage. The journey to Taipei is cathartic and although abandoned by her father on arrival, her grandparents Waipo and Waigong are welcoming and affectionate towards their granddaughter despite the language barrier. Her father is a contentious aspect of the narrative. A sinologist and scholar fluent in Mandarin, her father prioritised his career preferably to the deteriorating mental health of his wife. As her father increasingly travelled abroad, Leigh assumed the responsibility of primary caregiver and upon his return, he remained inaccessible and isolated. He continuously chastised Leigh for her creative medium, creating tension and frustration. The racially and sexually diverse characters are wonderful. The narrative also pertains to the American Asian identity and the sense of acceptance towards biracial, multiracial and migrant communities. My mother's hands have turned to wings. Her hair, to feathers. Her pale complexion now red as blood, red as wine, every shade of every red in the universe. 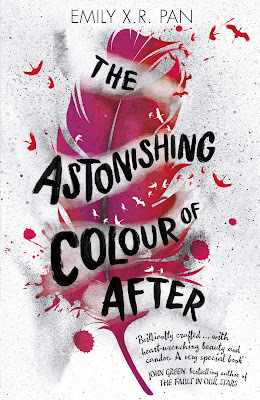 The Astonishing Colour of After is exquisite. The Mandarin Chinese dialect complements the affluent and atmospheric tapestry of Taipei and Taiwanese elegance. Debut author Emily X.R. Pan is extraordinary, a lyricist captivating readers. An impeccable read. It's an own voices narration and from all accounts, it's incredibly authentic as well. The love interest is also a Filipino Puerto Rican young man and her best friend is in gay female relationship. It's beautiful to see so many vibrant, diverse characters. The writing though, be still my beating heart! This is simply gorgeous! I am the Asian setting, and that her heritage plays such a strong part in this book. It's absolutely incredible Verushka, the culture, mythology and the dialect woven through an extraordinary narrative. It's breathtaking. What an interesting and unique premise! I hadn't heard of this, but it sounds lovely. I also love the sound of the diversity! It's beautiful, one of the loveliest narratives I've had the privilege of reading in a very long time. Wow, this sounds wonderful Kelly. I really need to read books like this one soon..and more. Added to my list! You definitely won't be disappointed Vanessa, it's so lyrically stunning. Oh wow, this sounds like such a beautifully written book. Depression is definitely not something that ever goes away, though it can sometimes be managed, and it sounds like the author handled that topic and the mother's suicide well, which I always appreciate. I'm glad to hear that Leigh had her grandparents to help her since her father was mostly absent. It sounds like he doesn't handle emotion well, which is true of some. She did Lauren, with the utmost compassion and realism. It in no way beautifies or romantises suicide and reillerated how depression in particular is a life long battle for many sufferers. I love young adult novels where grandparents playPa role in shaping teens, it's typically such a nurturing relationship. A beautiful read Lauren and would love to see what you think of it. <3 How poetic. 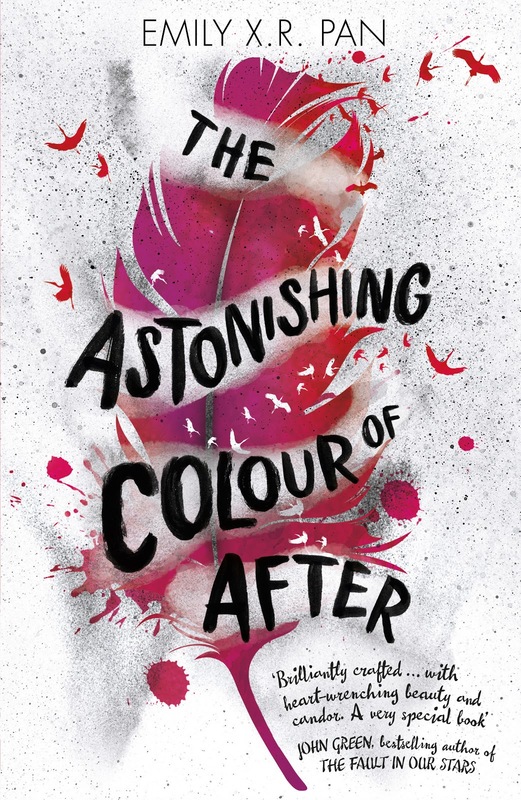 I love the title and the way the Leah characterizes emotions with colour. It makes perfect sense. It sounds like an emotional read, though. Regardless, can't wait to get my hand on a copy! It's utterly beautiful Joy. Meloncholic but cathartic. I loved the exploration of Taiwanese culture, it was so wonderfully atmospheric. It sounds just so beautiful! It reminds me a bit of I'll give you the sun for the writing and the colors and I just cannot wait to read a book that talks about synesthesia! Frannie, so lovely to see you! And a very similar lyrical tone as Handy Nelson as well actually. It's absolutely stunning. It's absolutely beautiful, one of the loveliest books I've read this year. Hurry up and read it so I can see what you think about it! You'll probably recognise all the cuisine descriptions and places Leigh visits with her grandmother. It's such a beautiful read Ailyn, I think you'll really enjoy it. It's actually an own voices novel Sophia so I'd love to hear about your experience relating to Leigh especially. It portrays suicide with such compassion and care. I'd love to see what you think of it. This is such a beautifully written review Kelly! It sounds like this one is going to be gut wrenching, both with the father's neglect and the grief she has to work through. Thanks Jeann, it's one of the loveliest books I've ever had the privilege of reading. The incredible magical realism aspects and immersive Taiwanese atmosphere was phenomenal. I love how you read so many diverse books! Also how you read so many books in general! Whenever I read your reviews I always want to read the books you're talking about but I just can't keep up! This is just another one that I've added to my tbr because of you... Hahah! Awesome review as usual, Kelly! The range of diverse books being released this year is incredible Lara and really shows how the tiring work by so many advocates is finally coming to fruition too. It's magnificent Lara and would love to see what you think of it. Thanks Amara. It's amazing, one of the best books I've read not only this year but in the years I've been reading young adult. Truly magical in every sense of the word. Happy birthday Karen! I think I wished you a happy birthday last week and since you didn't mention what day it was... I'll continue to wish you a happy birthday until the end of the month. What a brilliant gift to yourself, can't wait to see what you think of it. I've seen a lot of people talking about how beautiful this book is recently, and I have to say I am inclined to see what everyone is talking about. The small snippets you included in your review are quite stunning, and I imagine a book told in prose like that would be lovely, despite the heavy themes inside.